Buzzwole’s done a number on me this month. I am 4 W 8 L against the Protein Shake, including two losses with the Psychic Necrozma Looker deck I featured the other day. So as the old saying goes, if ya can’t beat ’em, join ’em. My two losses were against a Buzzwole Zoroark deck and an Espeon Garb deck. And I almost beat the Espeon Garb deck, came within 1 prize card, really 1 turn. 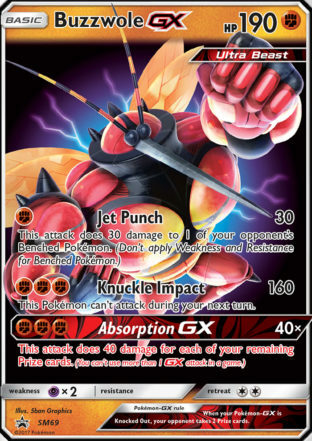 If he doesn’t have Guzma in hand on the last turn, I’m 9 W 1 L. Still, 8 W 2 L is good, but I’m pretty sure you could pair Buzzwole with Wishiwashi (GRI 37) and it would do pretty well. I am going to test that theory out over the weekend, though, and see how well Buzz does with Rampardos. Everything in here is pretty self explanatory. Spiritomb helped at the end of one game to get a draw supporter and Guzma so I had options after getting N’d down to 1 card. Carbink is great because if you retreat the giant mosquito out of the active, Diamond Gift lets you put those two energy right back on. I didn’t actually ever use Sudowoodo, and I might swap him out for Mewtwo (EVO 51). I love the puzzles in this deck, especially when you can use them to go grab a couple of Elixirs you’ve already played. I played the Switch a lot. It’s definitely a card your opponents don’t see coming. I didn’t play any strong so as to maximize the chances of my Elixirs hitting. Plus, there’s a ton of SPE hate running around right now, and not having to worry about E Hammers disrupting my plans was a nice relief. Is this the best design for Buzzodor? Probably not, but I had a good string of games with it, and I think it will win you plenty of matches if you’ve fallen behind on the ladder like I have!